Uglyworld #1896 - Prepares To Gets Frazzlereds! - (Project Cinko Time - Image 102-365), a photo by www.bazpics.com on Flickr. You may remembereds not too longs ago I was sharerings my lasts packeter of bacons rasherers withs my gooders buddy Turtle? 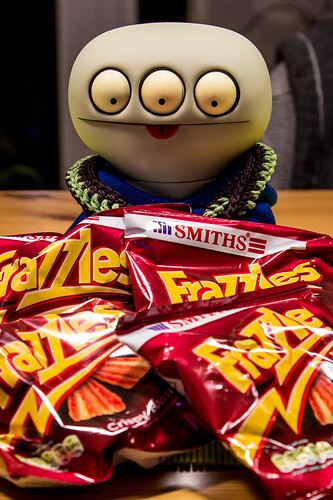 Well, boys oh boys does I has a surpriser in stores for the littlers hero in a half shell, a massivers pile of bacons flavour crispies, and bestesters of all, they callers this version "Frazzlers". "Hey Turtle, prepares to gets frazzlereds!"